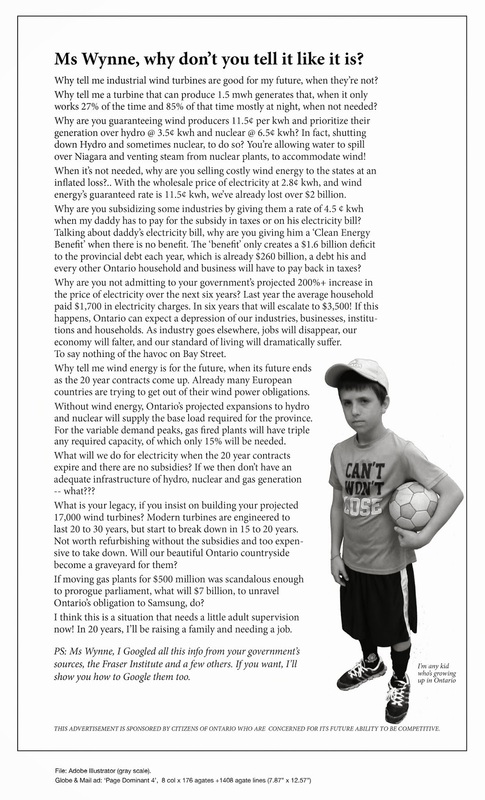 George Smitherman’s High Principle | Mothers Against Wind Turbines Inc. Yesterday evening, former MPP George Smitherman appeared as a witness supporting Windstream in its $475 million NAFTA suit against the Canadian government. Over the course of about 2 hours, Mr. Smitherman delivered what appeared to me to be a broadside against the Canadian taxpayer with little push back from Canada’s lawyers. Mr. Smitherman was asked to introduce himself to the Tribunal. He served three terms as an MPP, held portfolios of Health & Long Term Care and Energy & Infrastructure, and served as Deputy Premier. He explained that in the McGuinty government, a handful of top officials spoke with the authority of the Premier on issues of policy and that all major policy initiatives or changes in direction had to be cleared by “The Centre”, meaning the Premier’s Office. After a very brief examination-in-chief, he was cross-examined by lawyer Shane Spelliscy, who like many on the legal team for Canada, was one of the litigators in the Mesa case (pending a decision since that hearing ended in 2014). Initial questioning established that Mr. Smitherman was active in the green energy sector in the year after leaving government but his primary activity in this period was to run for mayor of Toronto. Over the course of his testimony, he made several witty remarks about his unsuccessful foray into municipal politics. Central to the government’s case is a twisty-turny hypothesis. Canada is saying the Ontario government was not prepared from a regulatory perspective to accommodate the development of the off-shore wind industry and that Windstream should have known this fact and abandoned its effort to develop the 300 MW, 130 turbine off-shore wind power project the Ontario government had contracted Windstream to build. In aid of this hypothesis, Mr. Spelliscy presented Mr. Smitherman with a press release issued after he had resigned from the government, the gist of which was that the government was putting off-shore wind development on hold pending the need for more “research”. Mr. Smitherman’s response was, ‘No one discussed with me during the development and early FIT period that the government wasn’t ready to accommodate the development of off-shore wind’ (My effort to record direct quotations should be taken as approximations only.) Elsewhere over the course of the testimony, Mr. Smitherman stated that the ministers of Environment and Natural Resources during his time expressed strong support for the Green Energy Act and the rapid expansion of green power production.